ATR provides cost-effective products and services wherever they are required. Aberdeen, Europe's energy capital, is our operational hub; our network of specialist facilities in and around the city delivers quality ATR services to customers in the UK North Sea – and around the world. We have an established base in Baku, Azerbaijan, from where we support a growing customer portfolio in the Caspian region. Keep up to date with the latest news and information from ATR. ATR Caspian and ATR Equipment Solutions Kazakhstan strengthen fleet offering by introducing Enerpac product range. 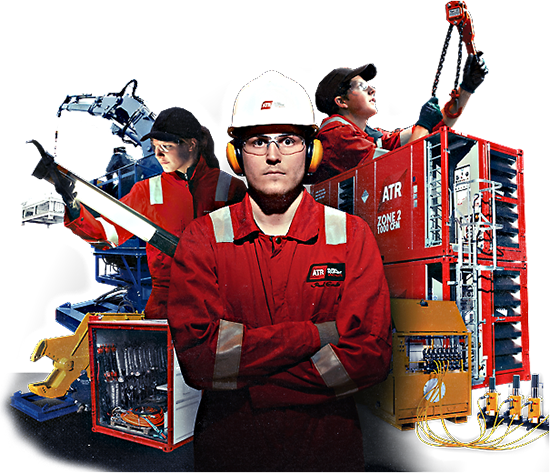 ATR, a Centurion company, are pleased to announce that divisions ATR Caspian and ATR Equipment Solutions Kazakhstan have been appointed as Authorised Enerpac Distributors by Enerpac, the world leading manufacturers of hydraulic high-force tools and components. The newly merged Aberdeenshire-based Underwater Engineering Services (UES) and Houston headquartered Seanic Ocean Systems has secured its first contract in Tunisia, a region which neither firm had previously operated in. ATR Group has announced a six-figure investment towards developing its inspection capabilities which will see in-house personnel delivering further rope access services and non-destructive testing (NDT), a method fast becoming one of the most in-demand techniques used by the energy industries across the globe. Last week ATR Lifting Solutions hosted a demonstration day to showcase the extensive capabilities that we possess and can provide to our customers across the vast range of Lifting operations within the Oil & Gas (onshore & offshore), construction, marine and renewables industries. ATR Group has commenced work on a new five-year contract supplying the lifting equipment and regulatory inspection services to one of the UK's largest oil producing companies. Centurion Group and ATR Group are to merge to create a global player in the oil and gas rental equipment and services market. Two more employees complete Modern Apprenticeship Qualification and Business & Administration SVQ Level 3. ATR Caspian was proud to support the recent European Formula 1 Grand Prix event in Baku, Azerbaijan. ATR provided load testing services on an integral element of lifting equipment within the vehicle recovery system. ATR Group recently provided one of the world's largest EPC contractors with two continuous demonstration days at our Equipment Solutions facility to showcase the vast range of innovative products and services that the Group can deliver.